leaders using unique intelligent exchanges across all academic disciplines. 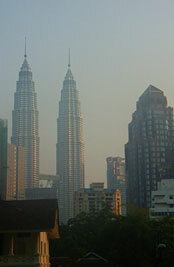 Kuala Lumpur is served by a comprehensive modern network of transportation systems. More than 30 foreign airlines fly in from various parts of the globe through the Subang Kuala Lumpur International Airport and KL International Airport at Sepang. 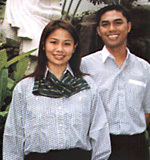 Travel from Kuala Lumpur International Airport (KLIA) to your Hotel in Kuala Lumpur City. Click here for more information. Railway lines and roads radiate from the city to many other parts of the country. Within Kuala Lumpur, buses, mini-buses and taxis ply regularly. The city's public transportation system will soon be further augmented by the Light Rail Transit (LRT). Kuala Lumpur is also served by the country's largest seaport, Port Klang. The ringgit (unofficially known as the Malaysian dollar), is the official monetary unit of Malaysia. It is divided into 100 sen (cents) and its currency code is MYR. Actual exchange rate for all currencies is here. With a height of 1,453 feet, one of the world's tallest buildings rise above the skyline of Kuala Lumpur. They are called the Petronas Towers, and, inevitably, they have become the symbols for the astounding growth that has taken place in Malaysia over the last two decades. 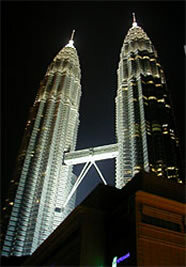 A good place to begin any visit to Kuala Lumpur is the one-stop information centre, which provides a general picture of what the city and Malaysia have to offer. Audio-visual equipment provides background information on each state in the country. You can book a tour, arrange to go on a trishaw ride in the city, change your money, and book air or bus tickets to various destinations in Malaysia. International calls, facsimile and telex services are also offered. For your first taste of Malaysian cuisine, there is a restaurant in the right wing of the building. Cultural performances are held daily. Thirteen kilometers north-east of Kuala Lumpur is the National Zoo. It contains hundreds of different species of animals, birds, and reptiles. The aquarium has an extensive collection of marine and freshwater species. Both the Zoo and Aquarium are open daily from 9am to 6pm. Located at Jalan Hishamuddin, this Moorish-style terminal was designed by architect A.B. Hubbock, who also designed the Masjid Jam. Built in 1910, it underwent extensive renovations in 1986. It is equipped with air-conditioned waiting halls, snack kiosks, money changing booths, souvenir shops, restaurants and a tourist information counter. Across the street is the Malayan Railway Administration Building, another fine example of the British colonial adaptation of Moorish architecture. It is linked to the station by an underground thoroughfare. Fifty years ago this site was occupied by a wet market. Today, the art-deco structure of the Central Market is a centre for the display and development of Malaysian culture, arts and crafts. There are many performances, demonstrations, and activities offered here, including batik painting, fortune telling, shadow puppet plays, glass blowing, dance classes, art classes, and many others. The building won the Coronation Architecture Design Award in 1953. Located at Jalan Tun Razak. The blue-roofed building was inspired by a tengkolok, the traditional Malay headgear, and songtet, a richly-designed brocade fabric. The library is a very recent addition to Kuala Lumpur, having opened only in 1992. The extensive holdings include a collection of publications on Malaysia by Malaysian authors as well as ancient Malay manuscripts. Open: 1Oam-5pm (Sat-Sun), Closed on Monday. The center of Kuala Lumpur's original Chinatown. Petaling Street maintains much of its traditional atmosphere, particularly at night when vendors spread their wares out on the street. While it is possible to purchase anything from gems and incense to toys and t-shirts here, enjoying the night market is really a matter of just wandering about and enjoying its sights, sounds, and energy.